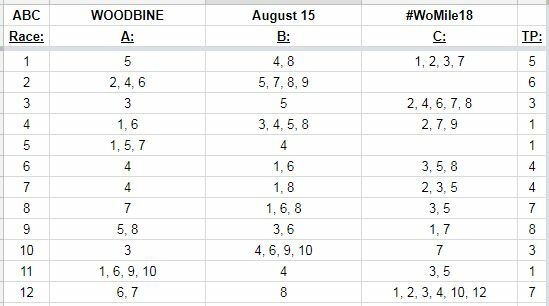 TORONTO, September 15, 2018 – The 12-race Woodbine Mile day card on Saturday, Sept. 14, is one of the best I can remember anywhere, let alone specifically at the Toronto oval. The challenging races offer plenty of challenging wagering opportunities with a $50,000 guaranteed Pick 5 beginning in race 2, a $100,000 guaranteed Pick 4 in race 4, a $200,000 Pick 5 with race 7, and a $200,000 all-stakes Pick 4 that begins with the $800,000 Ricoh Woodbine Mile Stakes. There’s also a mandatory payout on the Super High 5 in the nightcap, and that pool should far surpass the $1-million mark by the time they spring the latch on the 12th race at 7:06 p.m. EDT. In looking at the guaranteed pools that spans races 2-11, it becomes apparent how important certain races are. I.e., race 7 is the last leg of the early Pick 4 and first leg of the Pick 5. Races 4-5 are part of both early sequences, and all of the stakes races (8-11) are part of both of the late sequences. As usual, we’ll try to zero in on our strongest opinions to give us the best chance of cashing a big one. Sometimes, those strong opinions aren’t who can win, but who we think has a good chance of losing (especially at an underlaid price). Such a horse is #4 Circle of Friends in race 5, which is leg 4 of the early Pick 5 and leg 2 of the early Pick 4. Circle of Friends should get a lot of sport dropping out of stakes company, and his best is definitely faster than the rest, but all his other races are only as competitive as #s 1, 5, & 7. Catching one of those three horses would be much better than an odds on favorite. In order to spread in race 5, we’ll be narrow elsewhere, and no race more narrow than the third races (2nd leg of Pick 5), which appears to go through Mark Casse—either via his Wild N Ready, who’s by far the fastest of the horses who have run or his debut runner Dynatown. The early Pick 4 and late Pick 5 pivot on one of my most likely winners of the day, #4 Mystic Nile in race 7. This one stretches out for trainer Sid Attard—a move that has generated a bump up in speed ratings in the past. Backing a short favorite such as him is another reason to try to beat a vulnerable favorite elsewhere (e.g. the aforementioned Circle of Friends). The all-stakes Pick 4 is as interesting an assemblage of horses as you’d want to play with open Grade 1 races on turf at 1 and 1 ½ miles plus a 1 1/8 mile blitzkrieg for older females in the Canadian and Horse of the Year Pink Lloyd in the Bold Venture Stakes. Pink Lloyd certainly looks the most likely winner, and I won’t mind using him at a short price, as I think all three of the graded stakes turf races could produce an upset. In the Woodbine Mile, Oscar Performance is the top pick. Hopefully Delta Prince will take money with the local victory and owner. However, Good Samaritan and Divisdero both intrigue with a closing kick that could make things interesting late. There’s not a ton of pace, but the price compensates. In the Canadian, New Money Honey is the most likely winner, but Hallie Belle is a major threat at twice the price. In the Northern Dancer, it’s tough for me to trust Hawkbill as the favorite. I will not use him at all. Mekhtaal is my preferred choice among the horses expected to take money, but Tiz a Slam, English Illusion, and Patterson Cross are all worth a using as $15-plus horses. The above suggested wagers combine my top opinions. For a sense of how I feel about the contenders of each race, please look at the grid below. In races with multiple “A” horses, the one with the highest odds is the best bet. “B” horses are typically good value at 10-to-1 or better. “C” horses aren’t impossible, worth using with the strongest opinions, and might even be worth a bet in the 50-to-1 range. This entry was posted in Woodbine Insider and tagged Ed DeRosa, GRID, Horse Racing 2018 Ricoh Woodbine Mile event, Ricoh Woodbine Mile, Wagering, Woodbine. Bookmark the permalink.